Let me take a moment to breathe! Let me start off but saying this is a cliffhanger but lucky for us the next book is being released soon. This story starts out with tragedy, will either of them get their happily ever after?. I hate giving spoilers so I don't want to say much. This story grips your heart and keeps you guessing. Not everyone is who they appear to be and sometimes even when you think you know the real them, things happen that shows you a whole new side. Brandi is someone who has so many sides to her and Marco seems to only have one. But who really is the one in sheep clothing? Who is the greater of two evils? I loved the flow of this story and how well is all came together, everything was put together perfectly. The characters are deep and you feel connected to them. 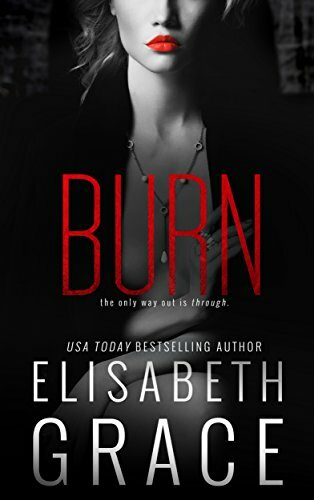 I can't wait to read Burn. This has to be a vague review because I don't want to give anything away and spoil the book. I will say you have to read book 1, because we pick up right from that heart-stopping ending. The action and suspense never let up. There is so much pain, heartache, and anger you can feel the anger vibrating through every word and deed. I never expected the direction things would go in, but that's what made it so good. Elisabeth really keeps the readers guessing. Just remember to expect the unexpected.